"1,178 visitors. 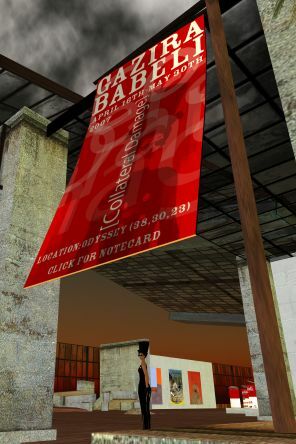 When she opened [Collateral Damage], Gazira Babeli was just over a year old. Many know her for her performances, staged "out of place" in non-conventional settings, in front of unwitting audiences which very often react badly. [...] Collateral Damage is a powerful statement. I exist, I am an artist, and this is art. 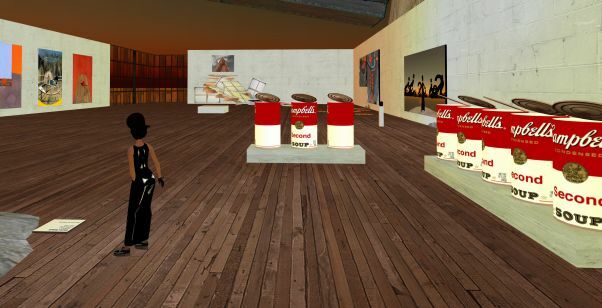 The show presents her past performances in installation form: Second Soup, giant Campbell's soup cans that attack the visitor; Singing Pizza, her sortie at Ars Virtua with two photographs and a few steaming pizzas; Grey Goo, a large print in front of which, on an impeccable support, stands a "Gazhat" which, when touched unleashes a shower of objects. Nice Quake is recreated in a niche: when you approach an earth tremor lifts a number of heavy stone slabs; and Don't Say... is a black tornado which whirls into life whenever the words "new media" are uttered. 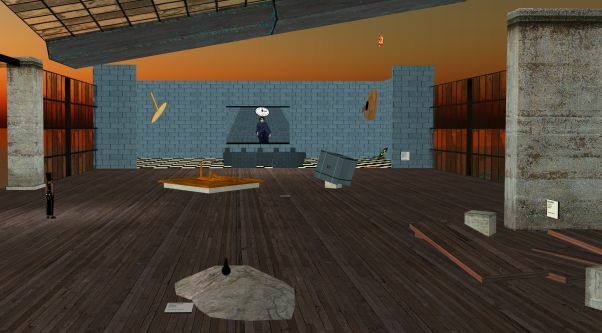 As for the new works, in the center of the big hall is Come Together: seemingly a simple pedestal surrounded by colored balls that the Second Life users will recognize as "poseballs", used to activate a range of animations (dance steps, sexual positions, etc.) 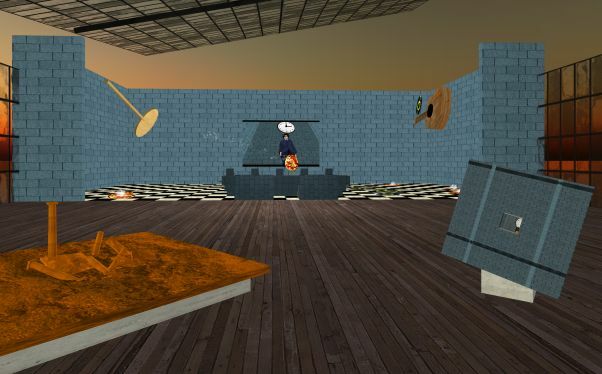 When you touch the balls you find yourself dancing on the pedestal, sharing the same center of gravity with others: an animated sculpture which is also a game, as well as an excellent place to park your avatar. 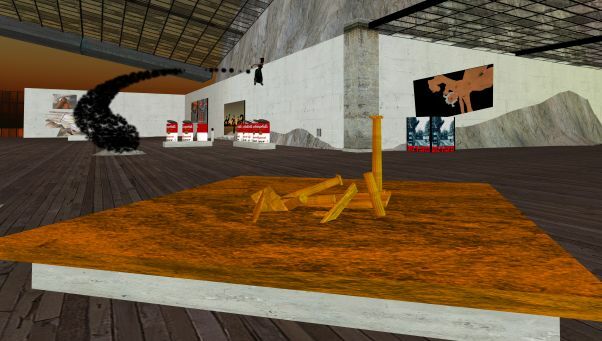 In the background is Nudes Descending a Staircase, while on the right, beside the models of two sets used in Gaz of the Desert, the desert and the call center - which are in actual fact linked to the settings in question, which we can visit in a simple click - there are three versions of Avatar on Canvas, alongside Buy Gaz' 4 one Linden Dollar!, which lets you buy a complete avatar of Gazira for a few cents. Then there is Come To Heaven that we can see in video form or try out, at our own risk. 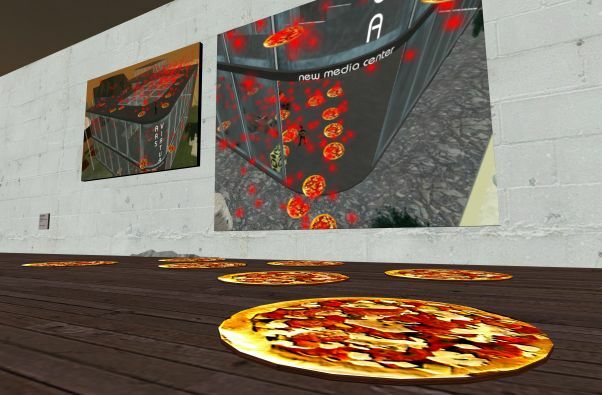 And in an adjoining area you can watch the film, that is if you manage to dodge the flying pizzas and singing vinyls being hurled across the room by a guitar and a spatula hanging in mid-air. 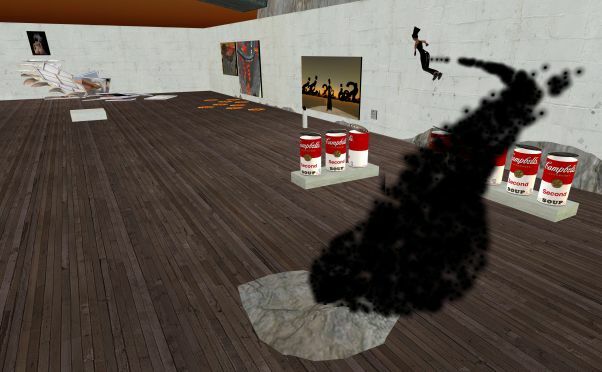 In a masterstroke Gazira has given the show the familiar appearance of a contemporary art exhibition, with prints, paintings, sculpture, videos and poverist installations. Warhol + Judd + Koons + McCarthy. But it is hardly ordinary to leave an exhibition having assumed the semblance of the artist, with limbs that look as if they have been stretched flat by a steam roller, after having done battle with a can of soup, danced like crazy with impromptu partners in even worse shape than ourselves, visited a desert and been buried under a slab of marble or a pile of paintings, among singing pizzas, bananas raining down from the skies and crazed LPs. A recognisable layout and a unique experience are what have turned an all but unknown performer into a cult figure, capable of drawing in over a thousand spectators from all over the world. 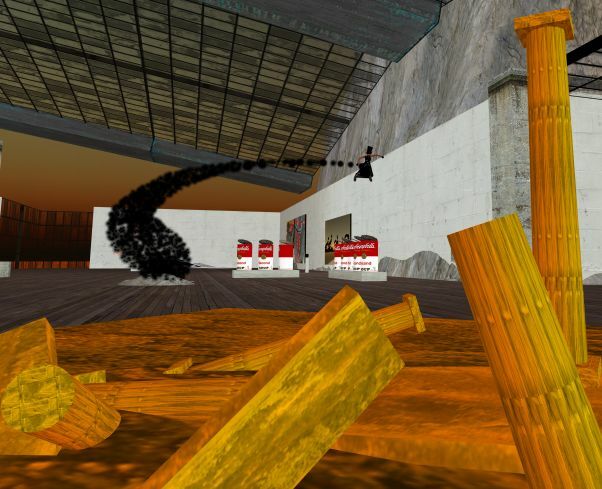 Collateral Damage is her Boîte-en-valise, her portable retrospective, an exhibition which is also a work of art. [...]"